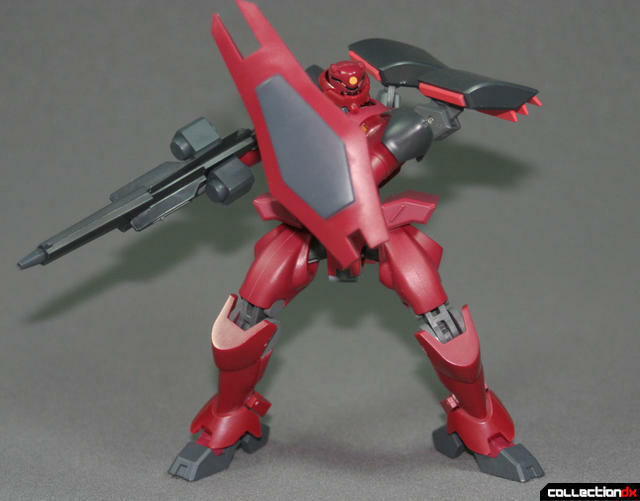 The GNX-704T “Ahead” is the heavyweight class of mass produced mobile suits constructed using the Pseudo GN-Drive technology from Gundam 00 - Second Season. The Ahead was originally developed by the Earth Federation and deployed exclusively within the A-Laws, the ruthless military organization controlled by the Innovators, a group of evolved humanoids with the goal of ultimately controlling humanity’s future. Surpassing the standardized GNX-609TIII “GN-X” (or “jinx”) the Ahead is given only to Ace pilots and is notorious for its load out containers of Anti-personnel Automatons for truth-obscuring, infiltration missions and operations for eliminating the Innovators’ enemies. 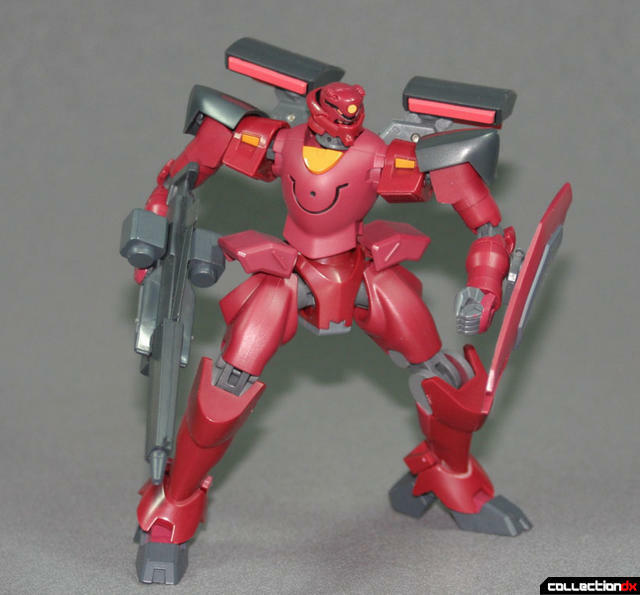 The design of the Ahead borrows heavily from the former Human Reform League model MSJ-06II “Tieren” combined with the power of the GN-Drives based on the third generation Gundams of Celestial Being. In the hands of an ace, the Ahead is far more powerful than a Gundam or any other mobile suit from the previous generations. While the standard model is the most recognized version, there exist a number of customized variations such as Graham “Mr. Bushido” Aker’s “Sakigake” and Soma Peries’ “Smultron” type. 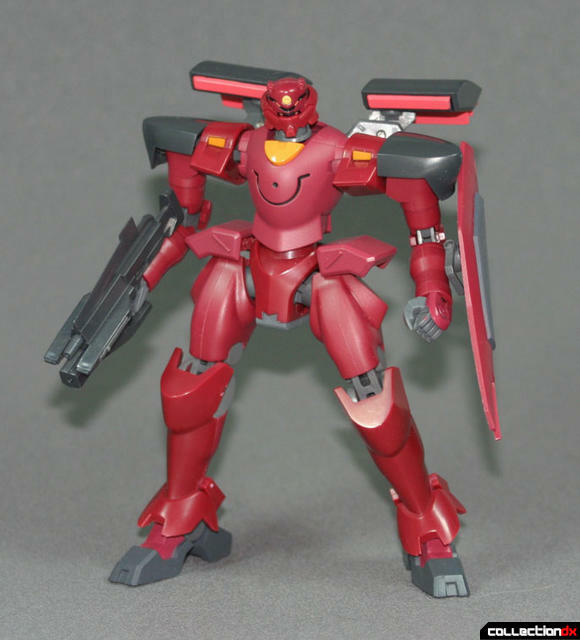 Continuing with the mass release of Robot Damashii (or Robot Spirits) figures based on Gundam 00, the Ahead has been recreated in its full simplistic and streamlined detail. 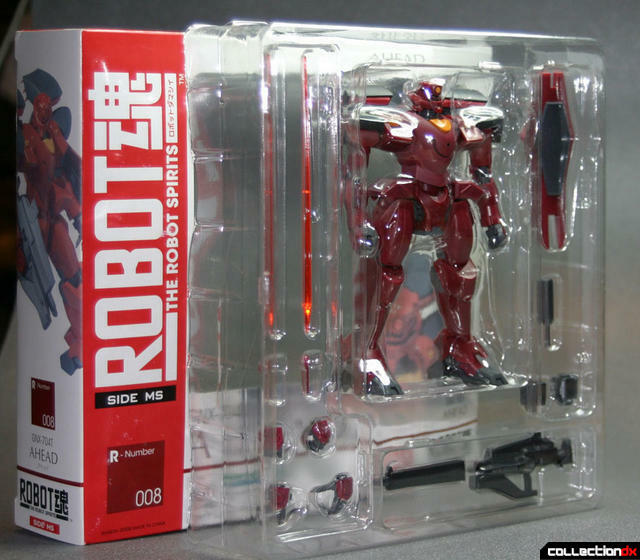 Boxed in the standard Robot Spirits format, only the Suit and its shield are visible while the Ahead’s accessories are laid bare when removed from the packaging. Out of the box, the Ahead stands at a miniscule 4 and 1/2 inches short, a contradiction to its heavyweight classification. Despite the missing height, the Ahead really is a well built figure. 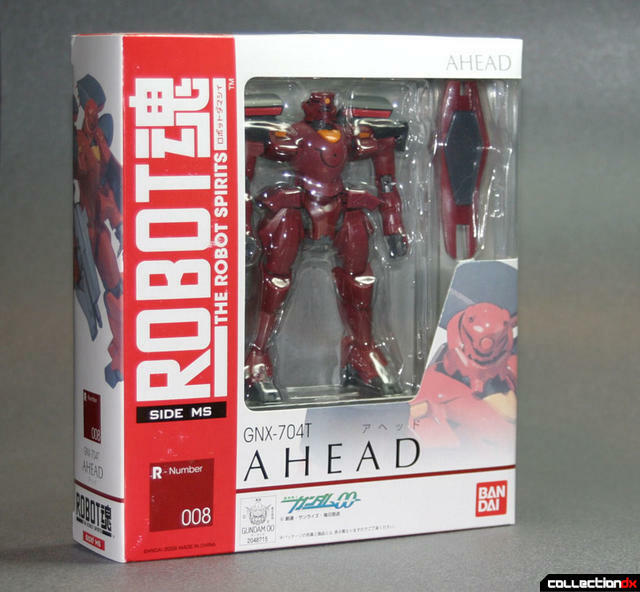 The Ahead’s primary colors have been recreated in its construction material with deep red and dark gray plastics while the remaining gray, orange and light red trim is painted on. Physically, the Ahead is an uncluttered design and has very few problems moving with or without its accessories. 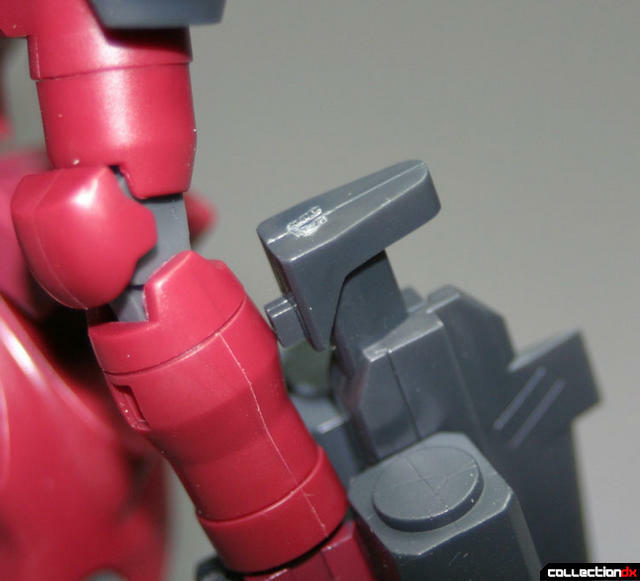 The wide range of articulation is based on a chain-link limb joint in the arms and legs, with ball socket joints in the ankles, waist, and neck. The Ahead also features a hinged shoulder block which mildly increases the arms’ range of movement. The Ahead’s shoulder armor uses a single link point that allows the armor to float freely and avoid blocking the arm motion. 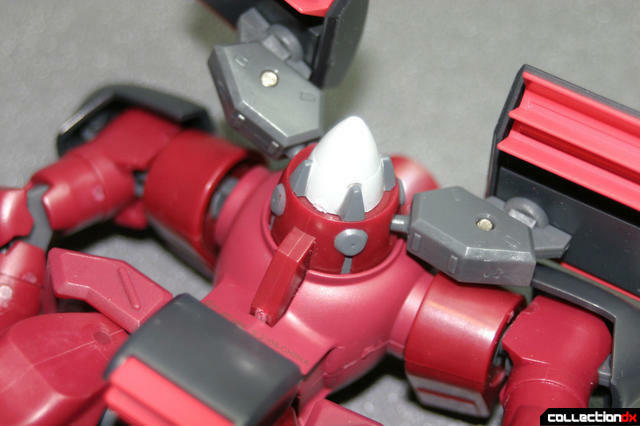 The arms for the Ahead’s shoulder mounted boosters are articulated at three points which give the Ahead more freedom to move around in its given range. 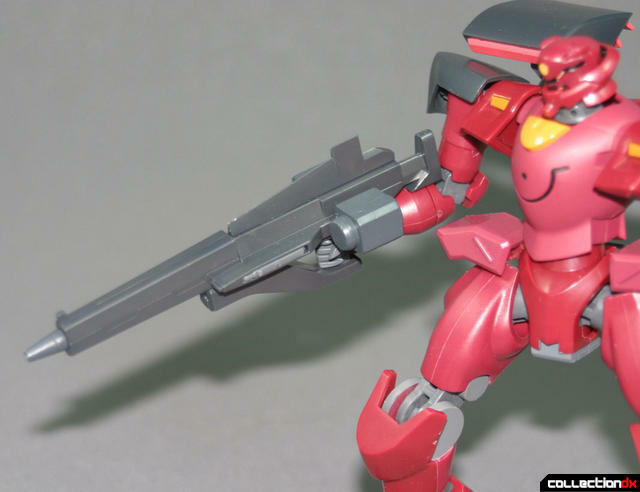 The Ahead comes with the bare necessities of any Mobile Suit: its shield, beam rifle, a pair of beam sabers as well as a single anti-beam grenade. The three pairs of hands packaged with the Ahead include two for holding the weapons, two molded closed fists and two splayed open palms for both arms. The Ahead’s shield has its mounting bracket attached via a ball joint to fit into two different points on the back of the shield. 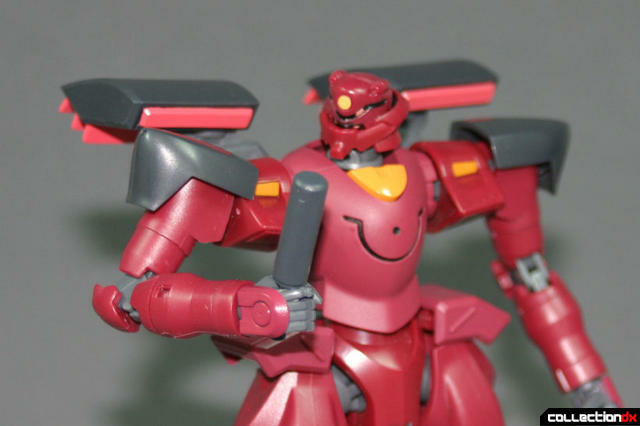 While there is a floating grip for its hands to hold onto, the Shield is just fine mounted against the forearm. The Beam Rifle is a lot of fun with its ability to be broken down from a long barreled rifle mode into a short sub-machine gun mode, simply executed by removing the long barrel attachment and the two battery magazines from the weapon’s sides. 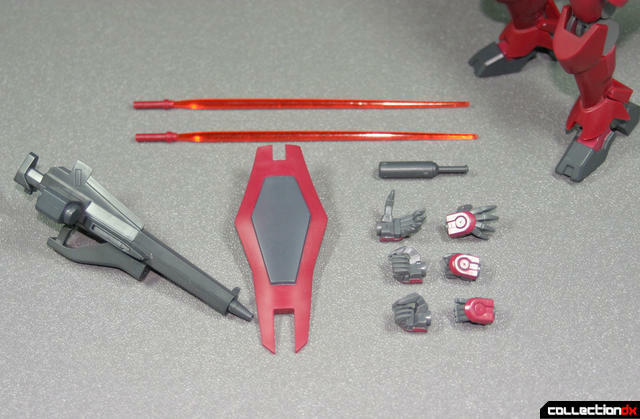 The beam sabers have detachable clear blades, but the grips have nowhere to be stored on the Ahead. 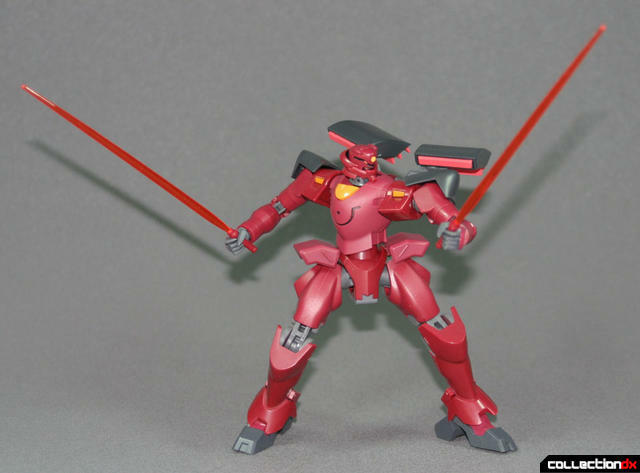 In the anime, the Anti-Beam grenade is a defensive countermeasure for deflecting and defusing particle beams in combat. 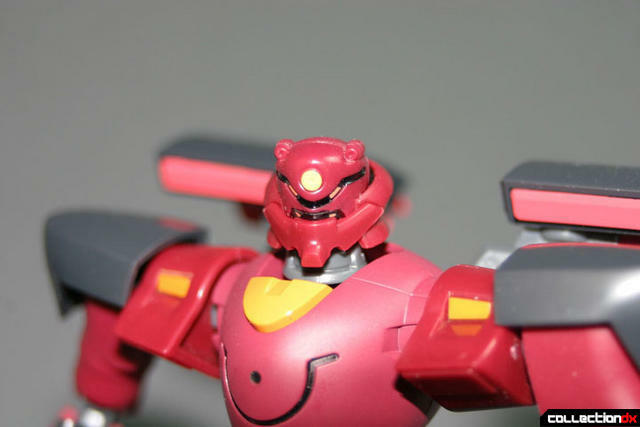 In the Robot Spirits figure, it is just another item that can go unnoticed or misplaced over time. As an action figure, the Ahead faces some quality control problems. There are a few points with excess plastic from its molding process still attached to the figure and there were some errors in the painting process which I corrected on my own. Sometimes it just pays to be a builder! 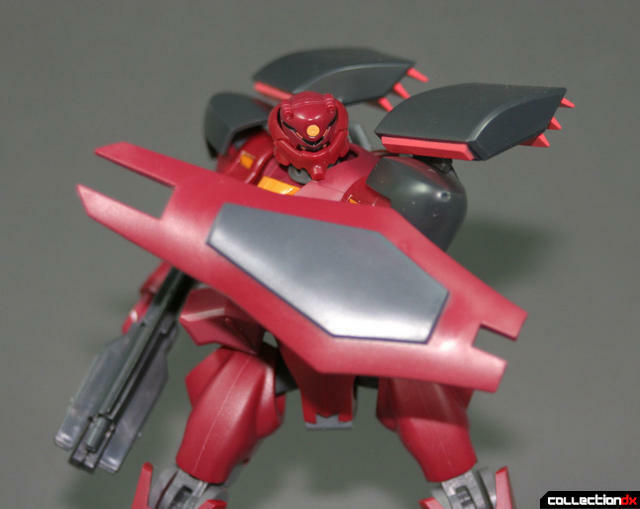 Even though the Ahead lacks the stunning and aerodynamic look seen in most of the Anno Domini era Mobile Suits such as the GN-X or the Gundams, it is still impressive. 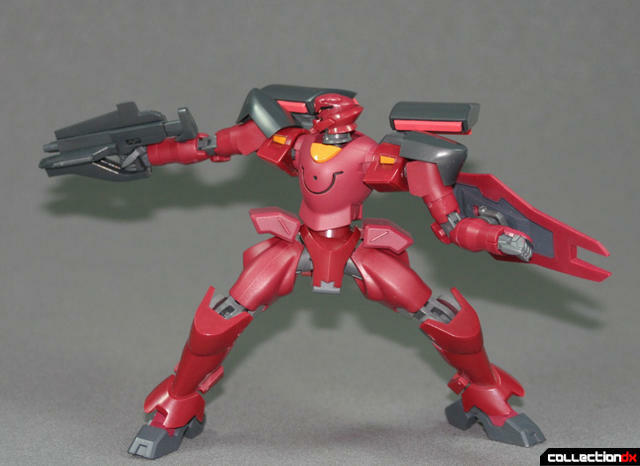 Compared to its variations and other Suits in toy format, the standard type Ahead might seems like another rank filling figure. Going into this, I had some hesitation towards this design, but now I am leaning towards getting the 1/144 scale model kit. 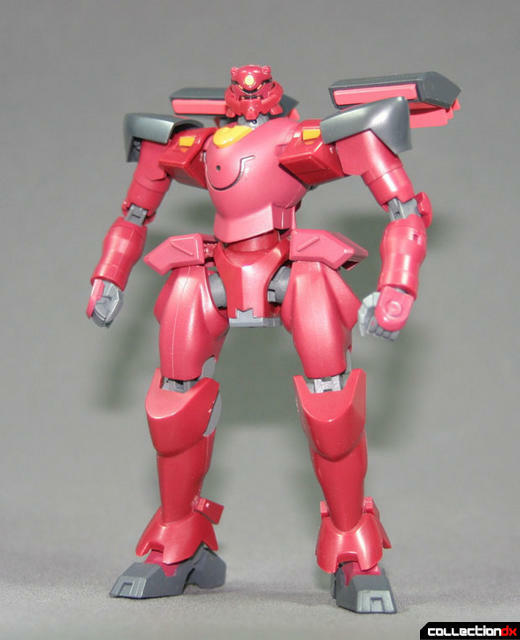 All things being though, the Robot Damashii Ahead is really nice and a good example of quality over popularity. Thanks to Hobby Link Japan for the sample! What is the white figure pictured in the comparison shot? 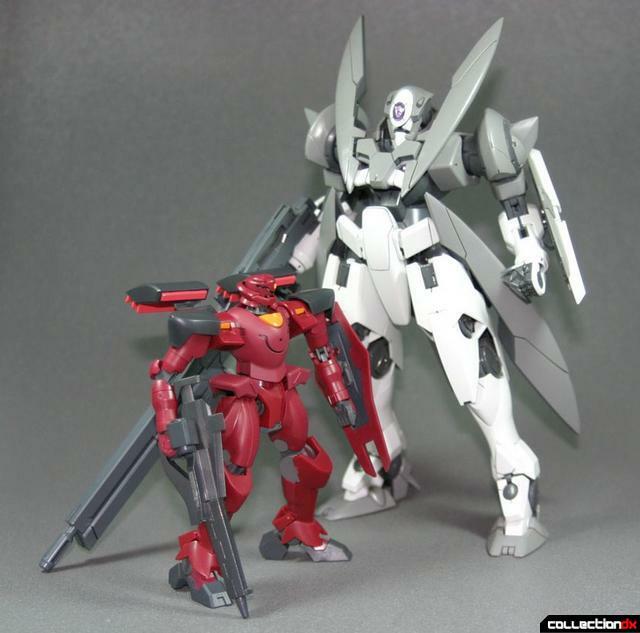 That is the Master Grade GN-X. 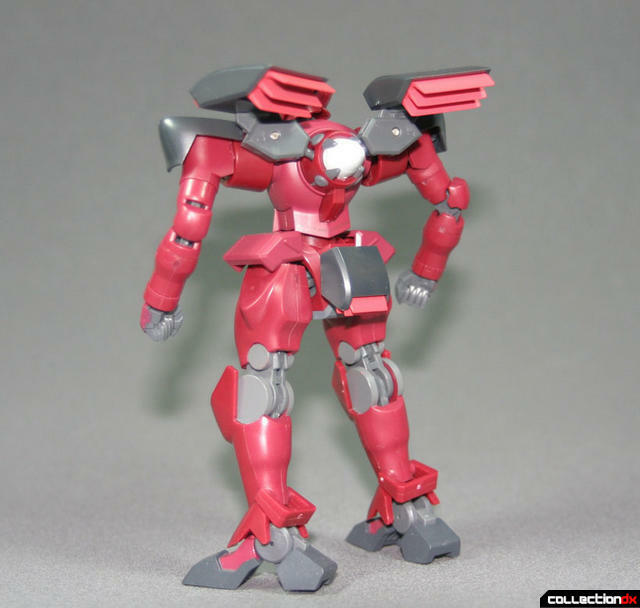 A great kit but it has some problems with loose fitting ball socket pieces and weak joints.